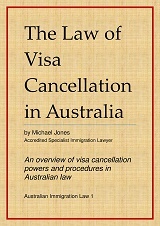 RMA Training is publishing a series of e-books on Australian Immigration Law, exclusively in Amazon Kindle format. 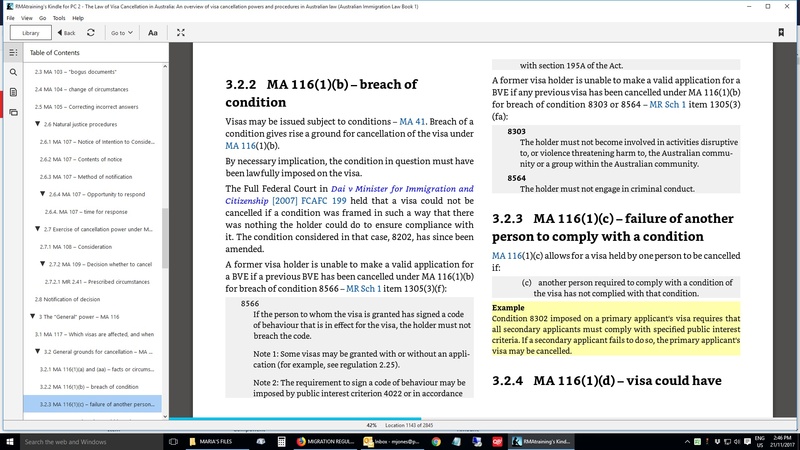 Each e-book contains a wealth of hyperlinks to current legislation and case law, as well as references to Department of Immigration policy. The text is designed to allow the reader to move between different headings and subheadings and return with a mouse click or screen tap. External links take you to legislation and court reports on the website of the Australian Legal Information Institute (AustLII), and other sites. You can copy passages for quotation, highlight text in a variety of colours, and add comments, bookmarks or notes for your future reference (these also sync across your devices). You can also take advantage of the latest Kindle features including free downloadable English and multi-lingual dictionaries that can explain or translate terms for you without having to leave the page you are reading. If you don't already have an account with Amazon, sign up at www.amazon.com.au. Once you have an Amazon account, you can download a free Kindle reader app for your PC or Mac, Apple or Android tablet at www.amazon.com.au/kindle-dbs/fd/kcp. You can download a separate app for each device that you intend to use to read the book. Register each app to your Amazon account and you will be able to sync your reading across as many devices as you like. Although a copy of the e-book will be downloaded to your device and can be read at any time, it is recommended that you connect to the internet while reading or studying in order to take advantage of the extensive hyperlinking throught the text. You also need to connect in order to sync between devices. For study purposes, we recommend that you open the books on a laptop or desktop with the free PC or Mac reader. You can then arrange the text across the screen any way you like (we suggest a two-column spread) and you can also keep the Table of Contents open on the left. Hyperlinks that you have opened in your browser can be kept open for reference while you read. You can also read these books on a stand-alone Kindle device, although some of the formatting and hyperlinks may not work as well on older devices.